Last year, one senior official of the Ministry of Health & Welfare of Japan was arrested on the grounds of a sin of omission, i.e., for not taking effective action as a responsible officer in order to prevent infection with HIV through the use of contaminated blood preparations that were imported from the USA. It is said that should he have decided to prohibit the use of non-heated preparations and to replace such preparations with heated ones, more than half of the HIV victims among hemophiliac patients would have been saved. In Japan such a case of indictment of a government official for a sin of omission is said to be very rare. Let us consider the possible sin of omission in TB control from the same point of view. It is clear that failure to effectively expand DOTS can add to the toll of TB deaths in precisely the same extent of this failure. This is what is happening everywhere in the world, but none of our colleagues, as far as we know, has been arrested. What is our excuse to ward off such accusations? Is it that we are not given enough funds, that we don't have enough staff, that our workload is too heavy…? In any event, we may not be legally accused. However, what is the critical difference between the HIV incident and the DOTS failure to make so much distinction in charging responsibility? The acute and straightforward nature of the consequences in the HIV incident may be an important factor. In TB control strategy, the benefit or loss is based only on probability, and a particular patient's death cannot be ascribed to the nonuse of DOTS. Accepting this argument, however, is becoming difficult, as can be seen in the results of a series of tobacco litigations, especially in the USA. Another possible difference between the two cases may be the degree of freedom in taking alternative actions (commitments) that could have yielded similar benefits. In the HIV problem, just switching to the newly available preparation could have averted the loss, i.e., the degree of freedom is one, and so its nonuse can be condemned as against the scientific conscience. In contrast, DOTS may be considered as one of many options to avert the TB tragedy. The DOTS expansion could be replaced with alternative strategies, such as conventional case management. This argument is possible only if DOTS effectiveness is assumed to be limited. In other words, the absence of a firm belief in the value of DOTS allows NTP manager responsible for slow DOTS expansion to be free from accusation!. We should remember the lawsuits of environmental problems on air pollution resulting in judgments that the government must assume responsibility for not having taken effective action to resolve the problems. Such reasoning leads us to the following critical question: Action on air pollution and DOTS -- which do you think is more surely effective? Putting aside the legal litigation on a small number of responsible officials, the too slow expansion or neglect of DOTS could eventually be viewed as criminal. If we allow this situation to develop, then we may be blamed for not being scientific enough in our service. 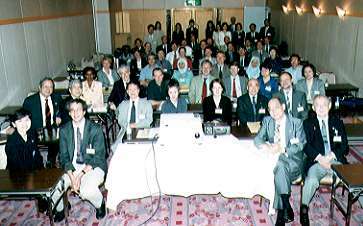 Tuberculosis Surveillance Research Unit (TSRU) was held from 10 to 12 May 2000 in Tokyo hosted by Dr Mori, RIT. It was initiated by KNCV, IUAT (current IUATLD) and WHO in 1966 and is held every year. 53 persons (members:18, and guests:35) participated from IUATLD, WHO and 15 countries including high, intermediate, and low burden countries. Main topics are as follows: (1) socio-economic aspects (poverty and TB, cost effectiveness of DOTS, cost of case finding in prisons in US, global demand for TB vaccine), (2) changing epidemiology of TB (trend in Japan, prevalence survey in China, TB/HIV in Tanzania, different treatment strategies in high MDR areas), (3) DOTS implementation (Bangladesh, Nepal, The Netherlands, Philippines), (4) RFLP (Norway, The Netherlands, Japan, Korea). Uniqueness of the meeting is to spend sufficient time for discussion. 15 minute-discussion was held for individual presentation and one hour general discussion for several presentations. This style of meeting leads to in-depth understanding among participants on similar topics. It had stressed more on epidemiological analysis before. But now it starts to include more aspects on programme implementation. 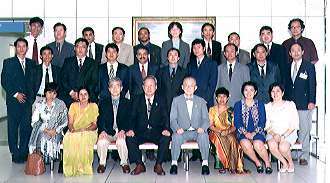 IUATLD Forum for Intermediate Burden Countries/Areas in Asia was held on 13 May 2000 at RIT. It was participated by Korea, Japan, Taiwan, Hong Kong, Singapore, Macao, Malaysia and Brunei with guests from WHO and IUATLD. Main purpose of the meeting is to discuss common problems especially analysis of stagnation of reduction in TB incidence in recent years. After presentation of problems and programmes, the Forum agreed to hold annual regular meeting in order to continue to exchange information and discuss issues such as screening for high risk group, implementation of DOTS and development of common TB information system in Asia similar to that in Europe. 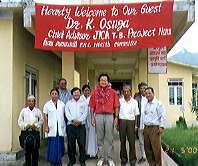 After completing the TB Training Course in 1996, I was sent to Nepal, the kingdom in the Himalayas, to work for the JICA TB Project. I was there for 3 years and 8 months, until I returned to the RIT in July 2000. Based at the National Tuberculosis Center in the capital city of Kathmandu, I was responsible for the overall management of the project with the major focus being on DOTS strategy. Although the typical image of Nepal is a mountainous country containing Mt. Everest, the highest mountain in the world, its population is concentrated in the plane, where access to health care services is relatively good. In 1996 DOTS was introduced to these areas first. Our project provided assistance to one of the four model areas selected for DOTS introduction. Encouraged with the initial achievement made in those model areas (cure rate over 85%), the DOTS strategy was introduced in other districts as well. One of the major difficulties in public health in Nepal is how to deliver adequate health care services to the population living in remote mountainous areas. The DOTS strategy was not an exception. Many people live in mountainous and hilly regions, where the nearest health facility is many miles away. Utilizing community-based volunteers (Female Community Health Volunteers) as the treatment supervisors for DOT, the project explored suitable and sustainable ways to apply DOTS strategy in those geographically difficult areas. By the time I left Nepal in July 2000, the population coverage by DOTS exceeded 70% in Nepal. As it was my first time to stay in Nepal, I came across difficulties from time to time, often because I lacked a better understanding of the culture and the ways things are done in Nepal. With the support of the NTP staff, many of whom are the graduates of the RIT International Training Courses, I was able to complete my assignment. The pace of Nepalese life is much slower than that of Japanese, and often time passes without much progress. As a typical Japanese, who expects outcome right away, I sometimes became frustrated with this attitude. One day, I was talking to a man in the countryside. He said, "Japanese people are unhappy rich, and we are happy poor". Many people in Nepal seem unwilling to change their traditional life style, while Japanese are often ready to accept something new, especially if it is more time-saving, convenient, and attractive. By doing so, something valuable in our culture might be easily lost without being noticed. During my 3 year and 8 month stay in Nepal, I had many occasions to consider Japanese people and the country of Japan. And I learned a lot from the people and the community in Nepal. 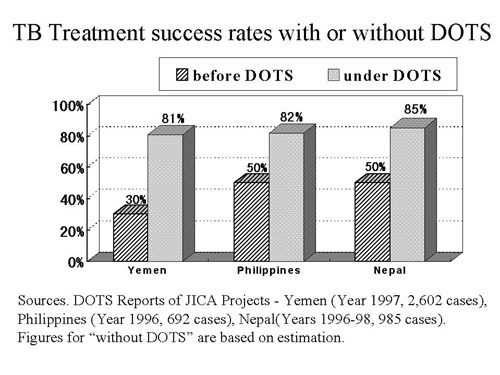 PPTI-JATA cooperation project on DOTS implementation at two PPTI clinics started in late 1997. In June 2000,a seminar for TB lab technologists was conducted in Jakarta by experts from RIT. They recommended that a good training management should take place to improve the lab quality. The Research Institute of Tuberculosis (RIT) has a good TB laboratory and implements a JICA training course annually. We could explain the importance of a laboratory for TB control, but many don't really understand what a laboratory does. In June 2000, I was given the opportunity to better understand how necessary laboratory work is to support TB control from the very beginning. DOTS strategy, WHO recommended strategy for TB control, necessitates a well-functioning laboratory from the very beginning to detect, follow up and determine results of treatment. Thus, the laboratory plays a vital role in the success of each case of intervention when we deal with Mycobacterium tuberculosis. The use of a regimen of drugs (invented more than 50 years ago) face the Multi-drug Resistance (MDR) TB problem caused by interrupted treatment, inappropriate treatment and neglected by physicians. Smear positive cases spread resistance bacilli to the community, especially in the poverty group. TB cases also increased in industrialised countries along with the HIV epidemic in the early '90s. These still remain public health problems in the new millennium even though we have the technology and method to control them. When diagnosing case and treatment follow up; laboratory smear examinations are still the most cost-effective and reliable method available. WHO guidelines for standardised case definitions arranged and categorised based on sputum examination were developed to enable a treatment and surveillance system. The PPTI-JATA cooperation project had pointed out the importance of a well-functioning laboratory from the beginning. After laboratory technicians were re-trained in smear preparation, whereas no smear positive cases could be found in the previous quarter, they were now able to find of 89 smear positive cases. All participants had to prepare their own Ziehl-Neelsen staining solutions, wire loop, make 80 slides individually and read them all afterwards. In smear preparation standard indicators were used, which are sputum quality, staining, cleanness, size, evenness and thickness. At the end of training and despite a wide range in participant backgrounds, an average result of 70% had been achieved in smear preparation. To notify of false reading, slide cross readings were performed using the IUATLD scale. Overall agreement (consistencies of negative and positive results without positivity grading between assessor and participants) averaged 76%. I wish to express my highly appreciation of RIT in its work and giving me the chance to improve my knowledge from time to time through their cooperation. I hope to attend RIT again in the future and meet all my friends especially Ito san, the dormitory authority. I'm here to do something and implement what I've learned at RIT. Thus far, I have accomplished something though it may seem limited. For a start, I was appointed as Regional Director of Regional-IX in Mindanao, which covers two chest clinics and six microscopy centers. The two chest clinics as well as one microscopy center are now implementing DOTS. My objective is to achieve an 85% cure rate and to implement of DOTS in the remaining centers in my area by year 2000. The PTSI (Zamboanga del Sur Chest Clinic and Dispensary) has already achieved a cure rate of 85%. The following details my activities for nearly three years. 1) In order to augment the city's performance on TB Control, the PTSI will cover the 10 barangays (local villages) situated in the poblacion, the most populated area, and to implement TB control measures as prescribed by the National TB Program. 2) To effectively implement the DOTS and augment its manpower, the PTSI can utilize the Barangay Health Workers (BHWs) located within the area involved as treatment partners and to identify infectious cases. 3) The PTSI should submit a list of TB cases for patients admitted for treatment to be used for monthly consolidation by the City Health Unit. Quarterly evaluation should be made by the CHO as prescribed by the NTP "Tutok Gamutan" (national language meaning DOTS). Anti-TB drugs will be provided by the Department of Health. 4) The said agreement will be disseminated to the barangays, Rural Midwives and BHWs concerned. ･ Visit is conducted weekly for the first month intensive phase and twice on the second month except those cases which need constant supervision. ･ Monitor patients for potential side effects from the drugs. ･ Pay visits to BHW to monitor problems encountered during the implementation "Tutok Gamutan". ･ Give health education to patients and families. ･ Schedule TB lectures in their area of responsibility. To complement the BHWs of the local government Health Unit, the PTSI is training 5-10 TB Extension Workers on DOTS by using modules for BHWs. As volunteer workers, they're provided with some cash for fare allowances and with incentives in the form of in kind. 3) A TB Diagnostic Committee was created through the help of the Provincial Health Officer, Dr. Corazon Silla-Ariosa, May 25, 1999. I already made a questionnaire to guide our staff assigned to conduct the interview. I had never thought I would go to Japan. However, when the opportunity came, I did not want to miss the chance, as I had heard a lot about the country, it's good economic status, longer life expectancy, and clean environment. The first day I arrived in Japan, things looked very different from my home country, so I thought I would neither adopt nor enjoy my stay while in Japan. But this was not true, as I tended to love Japan just as I love my own home country. This group training course was a mile stone for me. Though we participants came from different developing countries with different medical backgrounds, we all had one purpose while in Kiyose. We wanted to gain new weapons to fight tuberculosis and thereby help our people to live in TB free societies. I really had a pleasant stay while in Kiyose. The three long months enabled me to develop good relationships with other participants and with the community of Kiyose itself. I found I missed it for some time even after I had been reunited with my family. The course itself was very informative and very well outlined. I must congratulate the staff of RIT and the facilitators for their expertise in personally organizing the course. They taught me a lot of new things, which I hope to remember for some time to come. The field trips were excellent because they gave me the opportunity to discover the reality of the health services in Japan. The accommodation was perfect, though we had to be in at 10pm every night. This did not bother us much, however, as we had other recreational activities indoor as well. The lifestyle within the dormitory itself was a good experience for me, as I once again had to be responsible for my own welfare as in the good old days of college life. However, overall I am very proud to have been a part of this group training. I wish all my colleagues good luck and good work with their DOTS program. I am hoping to see or hear from my friends as to the outcome of their TB programs. The past six weeks was a short time, but it was a nice experience for me to participate in the 7th International Course on HIV/AIDS Prevention & Care in Japan. As one of the participants from 13 countries, I gained a wealth of information by being trained on HIV/STD/TB epidemic situation and response, project cycle management, participatory learning approach, etc. I was also impressed by the kindness, diligence and friendliness of Japanese people. I especially admired their willingness to face the future. All these fine experiences may be attributed to the detailed structure of the course, not only in topics related to HIV/AIDS, but also in exchange of culture. This experience will be in my mind forever, motivating me to interpret my learning into action, not only for HIV/AIDS prevention and care, but also toward helping build glorious future for the world. The Research Institute of Tuberculosis, Japan Anti-Tuberculosis Association underwent restructuring as of March 15, 2000. The Department of Education and Training is now the Department of Programme Support. This Department has four major activities, each placed under the responsibility of a Division. These are the Planning Division, Medical Doctors Training Division, Radiological Technologists Training Division, Public Health Nurses Division, and Library and Information Management Division. Program support of TB through region　:　Supporting special program business of TB. Training courses　:　For doctors, public health nurses, radiologist, etc. Collect and give information　:　Home page, developing teaching materials, arranging books about TB. 3) Reduce malaria-associated diseases by 50%. 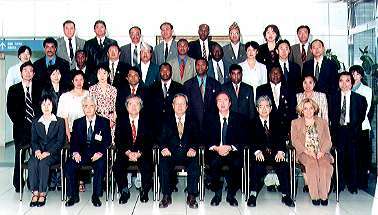 As a follow-up to its commitment on the control of infectious diseases at G8 Summit, the Government of Japan organized another conference in Okinawa in December 2000, inviting members from G8 countries, representatives of developing countries and UN agencies to discuss how to achieve these goals. Japan has already committed to donate 3 billion US$ in the coming 10 years for the control of infectious diseases, and welcomes cooperation from other developed countries. Stop TB Initiative will accelerate its efforts in case-finding to reach a target of 70% and to cure 85% of newly found smear positive PTB by 2005 to achieve this goal . It will then maintain this situation for five years until 2010. Japan will cooperate for this task from every aspect. In the case of HIV/AIDS, achieving the goal is much more difficult than with TB as currently available technologies are limited to intensifying health education, encouraging more extensive use of condoms, preventing vertical transmission and managing opportunistic infections such as TB. As I am now participating both in TB and HIV/AIDS control, I will try my best to strengthen our efforts in cooperating with the government and international agencies to bring these major enemies under control. Your news and voices are always welcome!